Choosing a garden shed - it’s as easy as ABC! Area: You should consider the following things before you purchase a shed. 1. Size - How Big Does Your Shed Need to Be? 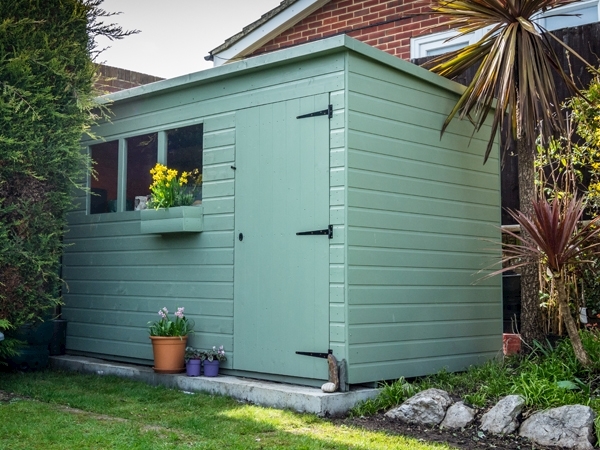 Consider what you are using your shed for – purely for storage or as a garden room with space for furniture? What will you be storing in there, and is this likely to change with a growing family? Keep in mind that different companies quote shed sizes differently. For example, an 8x6 shed could be referring to the internal or external dimensions and may or may not include the roof overhang. Be sure to check the dimensions of a building if you have area restrictions or wish to store something of a particular size. Exact dimensions can usually be found in the technical section. If your building will have a ridge height over 2.5 metres and is within 2 metres of a boundary, planning permission may be required. Always check with the local council if you are unsure. 2. Base - How Do I Prepare for my Shed? All garden sheds must sit on a firm and level base of adequate size. Most retailers will not offer a base, and this will need to be in place before the shed can be installed. Bases are typically built from concrete, paving slabs or timber bearers, and a correctly assembled base will prolong the life of your garden building. When deciding where to build your base, be sure to take the roof overhang into account – you don’t want to run water into a neighbouring garden if your shed is too close to a boundary fence. Also, consider a location which would provide an easy route through your garden if you plan on moving heavy objects in and out of your shed. Think about spaces to take advantage of natural light, nice views, or proximity to electricity or water supplies if you plan on wiring or plumbing your building. Be sure to check if your shed comes with a floor, as this is not offered by all companies. In general, these will come with pre-attached joists on the underside of the floor to lift the shed off the ground – but this does not eliminate the need for a base. If you are planning on building a timber base, the timber bearers must run in the opposite direction to the floor joists of the shed. Confirm this with the shed supplier and don’t rely on online photographs, as this may vary depending on the size of the building. It is advised to build a base that is slightly larger than the shed’s dimensions. However, if your garden has a slope, an overly large base could allow water to pool around the building. Read our guide if you would like more information on how to build a shed base. 3. Access - Do the Entry Points Have Easy Access? Consider the size of your garden, and any fences or walls that are near the area you want to install your shed. Close fences or walls will prevent you from being able to easily treat or paint the shed. Some companies can change the door position of a shed if required, so be sure to check this if you need the door re-positioned to provide better access. You should also consider if you want the door hinged on the left or the right. Some shed retailers offer a pre-hung door, while some will provide the door separately to be hung on assembly. Will there be anything in contact with the shed, such as overhanging branches? Try to ensure that nothing touches the shed, as branches could damage the roofing felt. 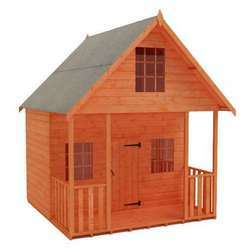 Build: Sheds are available in the following materials: wood, metal, and plastic. 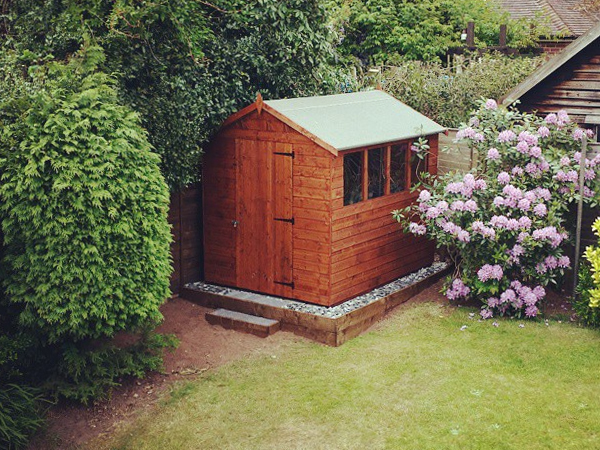 Wood is the traditional material for a garden shed, and by far the most popular. 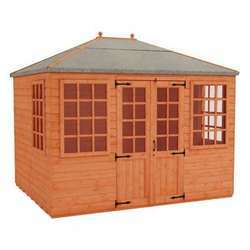 Many sizes and styles of timber shed are available, and they can easily be painted to your chosen colour. Wood’s natural beauty and relative durability makes it a great choice for garden buildings. Wooden sheds require annual treatment with a suitable timber preserver for maximum longevity. Most sheds will come pre-treated with a temporary preserver to protect it through storage and transport. It is recommended to re-treat the floor before installation, as the underside will be inaccessible once the shed is assembled. As wood is a natural product, you will often find some knots, minor splits or areas of sap – these are characteristic of timber and will not affect the strength of a building. Pressure-treated (often called tanalised) sheds do not require as much maintenance as standard wooden sheds due to the treatment process. These are more expensive but tend to last longer. Metal sheds are rising in popularity. They’re low-maintenance and provide a modern, industrial look. Galvanised steel sheds are highly durable and resistant to rust and rot. They do not require treating and they usually will not need to be painted, other than for the occasional patch job. 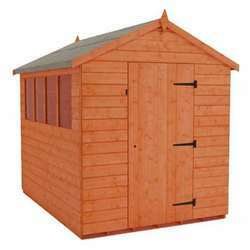 Metal sheds are particularly secure, and typically available in a variety of colours. Cheaper metal sheds tend to come without a floor, but it is advised to check before purchasing. Plastic sheds are lightweight and virtually maintenance-free, with many styles that give the appearance of wood or metal. They do not require treating or painting, and are usually fully resistant to wear and tear. 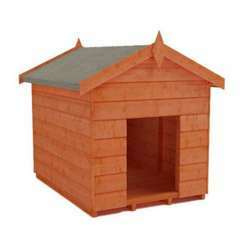 Plastic sheds are not as common as wooden or metal, but they’re very sturdy, weatherproof, and easily assembled. Construction: If you’ve chosen a wooden shed, there are a few options to choose from. 1. Overlap or shiplap cladding? Overlap is a more economic style of cladding, with a rustic look due to its rough-cut boards and overlapping finish. Overlap boards are typically compared to fence panels. Shiplap cladding features interlocking tongue and groove boards, with a slight profile to enable water run-off. Shiplap cladding is usually thicker and better quality than overlap. Loglap cladding features interlocking tongue and groove boards, with a curved finish. This provides the aesthetic appeal of a traditional log-constructed cabin, with a similar quality to shiplap cladding. At its thickest point, loglap cladding is generally thicker than standard shiplap. 2. Pressure-treated or dip-treated timber? Treatment is important to maintain the appearance and structural integrity of a wooden shed. Dip-treated timber is submerged in a bath of a protective preservative before being left to dry. It is strongly recommended to re-treat the wood before or shortly after installation, and annually thereafter to ensure the longest possible life. The underside of the floor should be treated before installation. Preservatives may be clear, tinted or paint-based – allowing you to change the colour of your building while also protecting it. The majority of sheds are dip-treated. Pressure-treated timber is submerged in a preservative under high pressure, causing it to penetrate deeply into the wood before being left to dry. Pressure-treated timber is more expensive, but the wood will generally last longer. The timber in dip-treated sheds is usually guaranteed for 10 years against rot, decay or insect infestation, while pressure-treated sheds are often guaranteed for 15 years. Be sure to check if there is a guarantee and its conditions, as it may be invalidated if the shed has not been treated properly. Framing is an important element of a shed to consider, as thicker framework will result in a more robust building. The framework provides strength, support and durability, so be sure to check the framing size when comparing sheds; this is often displayed in the technical section. There are usually options to upgrade framing thicknesses e.g. from 28mm x 44mm framing, to heavy duty 58x44mm framework. Design: There are plenty of choices when it comes to choosing your perfect shed, with many styles available and often opportunities to customise. 1. An apex or pent roof? Though this can be mostly personal preference, there are a few things to consider when choosing your roof. Apex roofs feature two slopes, meeting in the centre. 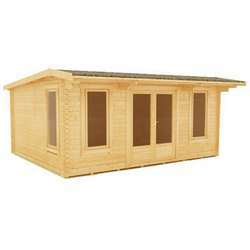 This provides additional headroom in the middle that is ideal for moving around in the shed. The apex style of roof is more traditional and also more popular. Apex sheds tend to have doors on the shorter end, but some retailers will allow you to move the position of the door. Pent roofs feature one slope, usually angled downwards from the door. They offer a modern style with a more gradual change in internal height, allowing additional headroom for entry. Pent roofs are more suited to locations next to walls or fences. The door is typically on the longer side, but some retailers will allow you to move the position of the door. The slopes on both an apex and a pent shed allow water to run off with ease, preventing pooling. 2. Windows or no windows? Windows provide natural light, and these can often be upgraded to opening windows to allow more air into the shed. Most windows are made of styrene as standard, but this can be upgraded to glass or toughened glass for increased durability. You may wish to check the position of the windows in relation to your garden to take advantage of brighter areas, or for a better view. Some people prefer to keep the contents of their shed hidden, and so a windowless building would be a better option. 3. Single or double doors? Most sheds have a single door, and this is usually sufficient for most storage. 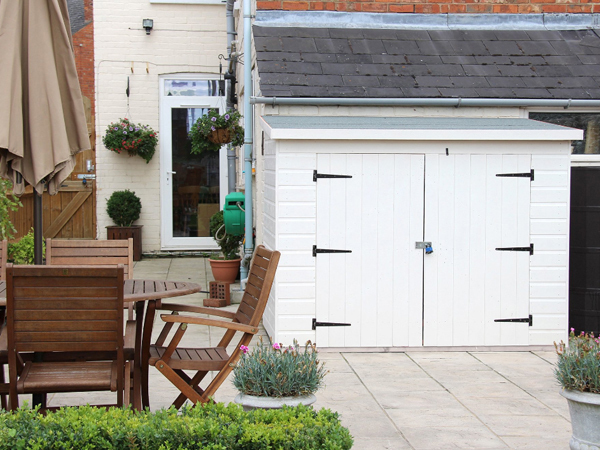 However, a double door provides better access – perfect for those storing large objects, bulky equipment or bicycles. Stable doors are also often available as an upgrade. Another option to consider is what side you want the door to be hinged, which may be an access issue. Some companies will give you this option when buying the shed. 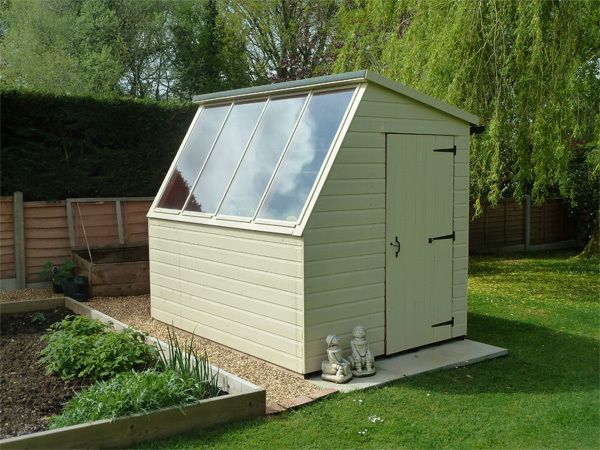 While sheds are generally quite straight-forward to erect, it can seem a daunting task for those of us with little or no DIY knowledge. Some companies require all sheds to be self-assembled, while some will offer installation as an additional extra. If you purchase installation, please note you would usually still need to supply a firm and level base, and you may have to take the shed from where it has been delivered to where it is being installed. Ensure access is clear around the base, allowing adequate space to erect the building. Installation is often on a separate day to the delivery date, so check this in advance of the purchase. Be sure to have a suitable base in place. If the installer arrives at a property to find that the base is unacceptable, they may charge to revisit. If you’re using your shed to store valuables such as motorcycles or expensive equipment, you may wish to consider security upgrades. These could be items such as anti-vandal screws, a security bar across the door, an internal security bike post, and additional locks and padlocks. 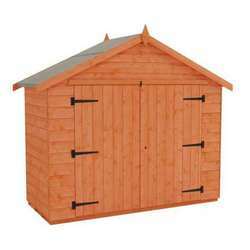 Check what items the shed comes with as standard – does the shed come with a lock? There are many accessories available to add attractive touches to your shed, such as: a door pull, window box, shelving, paint, and treatment. These are many things that people think about once the shed has been delivered, but it is a lot more convenient to consider these before you make your purchase, so everything can arrive together.